We’d been keeping an eye on Hurricane Irma from our house in Huntsville as she made her way across the Atlantic from Africa’s western coast. Cindy and I had decided we really weren’t ready to sell our house yet, so we’d pulled it off the market and spent most of the summer getting our stuff moved out of storage. This being hurricane season, we had to keep a weather eye out for any storms that might threaten the east coast of Georgia even as we focused on our house. As much of the country saw with Harvey and Irma, predicting where a hurricane will go is an inexact science at best with a number of factors influencing the storm’s exact path; wind shear, seawater temperature, the existence of nearby high- and low-pressure systems all can exert major influences on a hurricane’s trajectory. To make prediction matters worse, researchers use a number of different models that often do not agree closely with each other. As a result of all of these factors, storm path predictions are only reliable 2-3 days out. However, as the days wore on, it became more and more apparent that the east coast was at high risk for taking a direct hit. All the “spaghetti models” showed Irma’s track running along Florida’s east coast or right up the Florida peninsula. 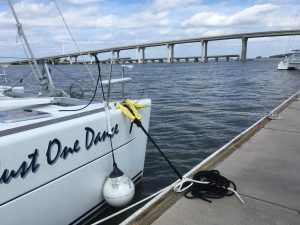 Either way, Jekyll Island would be seeing significant winds and storm surge, so we needed to get there quickly to prep Just One Dance for the coming blow. One of the reasons we keep the boat at Jekyll Island is that up until last year, the area had not experienced a full-blown hurricane in over 100 years. Now, for the second year in a row, we would have to prep our boat and pray for the best. We left Huntsville Thursday, the plan being to run down, get the boat ready and then head out before the expected mandatory evacuations turned the interstates leading away from the coast into a parking lot. Even though state authorities utilize “contra-flow” (routing traffic away from the coast onto both the east- and west-bound lanes of the interstate) during such evacuations, the shear volume of traffic still clogs the roadways. Traffic moves at a crawl or not at all, gas stations along the way run out of fuel, restaurants are jammed, engines overheat and tempers flare. On the way down I-75 and I-16, we could already see traffic running bumper-to-bumper in sections of the roadway (heading in our direction, towards the coast, the traffic was unsurprisingly light). In the afternoon we got the word that the governor of Georgia had ordered mandatory evacuation of all coastal counties starting at 8:00 am on Saturday. That would give us Thursday evening and most of the day Friday to ready the boat and then get back on the road before the interstate became clogged. Fortunately, removal of our sails, the most time-consuming task, had already been done for us. 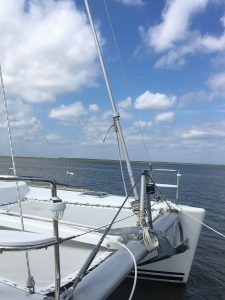 The sails are easily damaged in hurricane force winds; even if you tie them down, if the wind catches enough of a sail’s edge, it will pull the whole sail out and shred it. 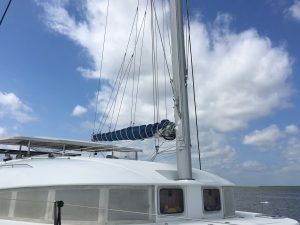 Since we were having the edges of our canvas resewn, Mike and his crew from Dunbar Yachts took the sails down on Tuesday, alleviating us of having to perform this time-consuming task. We arrived at the marina around 7:00 pm. Our friend Rich was there, ready to tow our dinghy around to the boat haul out station so the marina crew could pull it out of the water the next morning and store it in the dry stack warehouse. 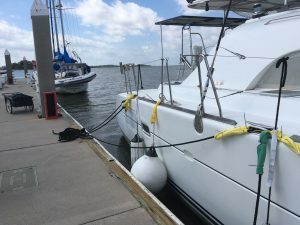 Our outboard wasn’t working (the carburetor got salt water in it due to a torn cowling gasket, causing the throttle plate to seize) so Rich used his tow boat to move our dinghy around and get us tied off to the dock. We spent a couple more hours Thursday evening removing anything that could be damaged or become a projectile in hurricane-force winds and storing it down below. Our friend Lynn from the Millie B. stopped by to talk to us and gave us the bad news that the mandatory evacuation for Glynn County had been moved up to 8:00 am Friday morning. Great! Now I-16, leading away from the coast, would start clogging up 24 hours sooner. This was my real concern; the storm would not reach Jekyll until early Sunday morning, but getting caught in the evacuation traffic jam was a real possibility. Cindy and I got up early on Friday morning to finish up our preparations. 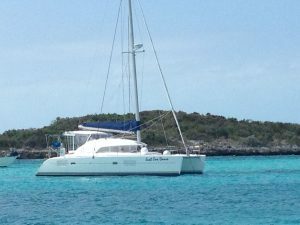 We got the dinghy hauled out and moved the boat forward on the dock since another sailboat had wedged in too close behind us for our comfort. 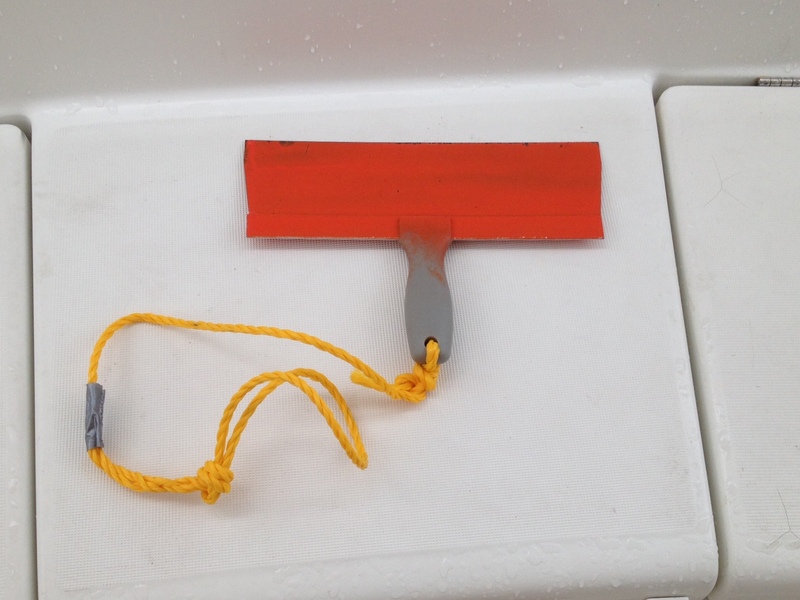 We doubled up on all of our dock lines and ran extra lines from the bow and stern. 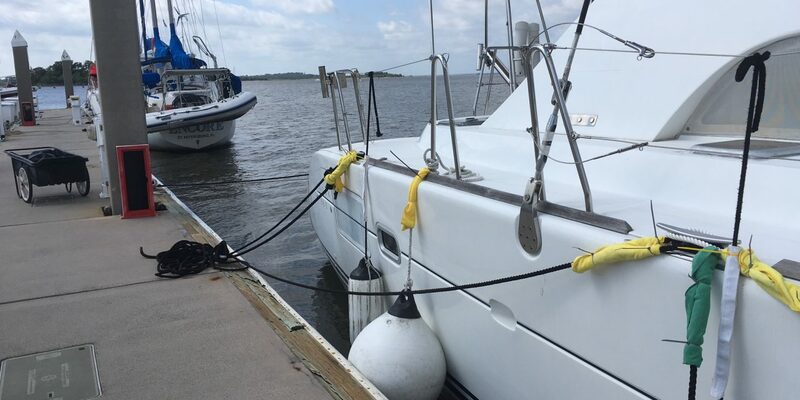 We got out the “big boy” fenders that we bought after our experience at Fernandina Beach during our first sailing season and strapped them to JOD’s side to hold our boat off the dock. When we were done, we took video of our prep in case it was needed for an insurance claim after the storm. 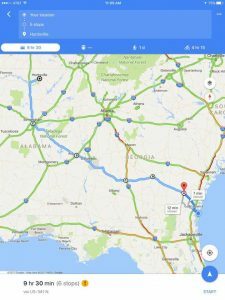 Throughout the morning, I kept checking Google Maps to see how traffic was flowing on I-16 and I-75, and the news wasn’t good; miles-long stretches of I-75 were showing up red, indicating serious traffic jams. 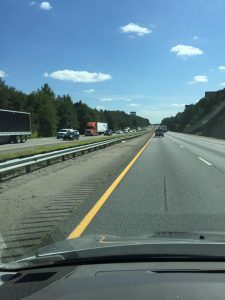 I-75 North was bearing the brunt of the evacuation traffic, not only from Georgia but also from Florida residents that had been evacuating for two days. Our alternate route, going down to Jacksonville and then taking I-10 west to I-65 north, was seriously backed up as well. If you’re not familiar with the Google Maps traffic feature, its worth checking out if you’re headed out on the road. Google tracks the speed at which cars are moving via the occupants’ cell phone GPS and rates traffic speed on a green/yellow/orange/red scale. Kinda scary that our cell phones are being used for this without our permission but a handy feature when you need it. We finished our hurricane prep and were packed up ready to leave a little before noon. We decided to take the “backroads” highways rather than the already-clogged interstates. It would add a couple of hours to the trip and was a bit of a risk since a lot of other folks might have this idea too, but it was guaranteed that we would get stuck going our usual route. After all of our concerns, though, the trip back turned out to be a really nice ride; we never ran into any significant traffic, gas was readily available and we had an easy time stopping for lunch. Most of the roads we traveled on were four-lane divided median highways and seeing green rolling landscape and the small Georgia towns we passed through was rather charming. We rolled into our driveway around 9:00 Friday night, exhausted after our whirlwind trip but satisfied we had done everything we could to keep JOD safe.